Dubai, UAE, April 11, 2018: Many people know that their mental and emotional wellbeing is as important as – and can actually affect – good physical health. In our busy, modern lives we can often feel removed from nature and even ourselves. So HJÄRTELIG collection invites us to press the “pause” button, if only for a little while, on a daily life that’s often hectic, complicated and online. 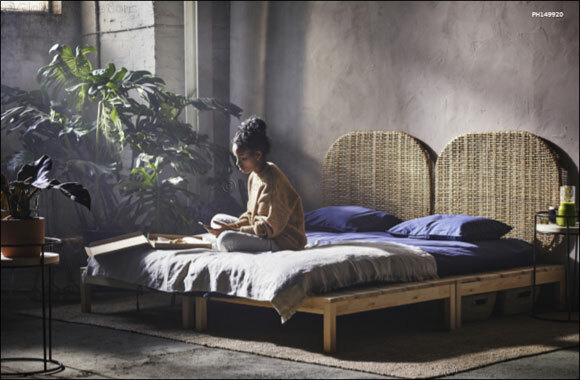 Whether to practice some yoga, to tend to a plant or simply to relax amongst beautiful, natural materials, HJÄRTELIG collection is about the moments to re-focus and to revitalise ourselves. Designed with a delicate touch, these home furnishing products have a light and peaceful feeling, yet are useful and durable for everyday life at home. The designers of HJÄRTELIG collection are Andreas Fredriksson and Maja Ganszyniec. From a multifunctional bed for stretching out, to yoga kit for comfortable workouts, to scented candles for a calming ambience... HJÄRTELIG collection is a range of furniture, home furnishing accessories and yoga kit that’s designed to create a pleasant atmosphere for rest, relaxation and gentle exercise. Special attention was given to the use of beautiful, natural materials that appeal to the senses and help us to feel grounded. Cotton from more sustainable sources, rattan, linen, cork and solid pine all lend their unique qualities to different items. The calming appearance, the reassuring textures and even the natural scent – all these make HJÄRTELIG collection an everyday pleasure to use. The materials in HJÄRTELIG collection are important for their sensual qualities, which make them ideal for everyday use. They also make a statement about the common desire to live in closer connection to the natural world. The IKEA approach is to lead the way towards more sustainable materials and processes. Today, around 98% of the material in IKEA products and packaging is renewable, recycled or recyclable. And the aim is to do even more, although various rules and regulations mean that the magic figure of 100% remains just out of reach. For example, since September 2015 all IKEA cotton is either recycled or grown in a more resource-efficient way that also benefits the people who grow it. And, by 2020, all wood will be recycled or certified by the Forest Stewardship Council (FSC). Other natural materials in the collection such as cork, linen, rattan and seagrass are durable for day-to-day use. And they also have long-term benefits for the wider world, as resources that are more sustainable to harvest and process. Better Cotton has been used in all IKEA products since Sep 1 2015. This means that the cotton is either recycled or grown with less water, chemical fertiliser & pesticide while increasing profit margins for farmers. Cork is an impermeable buoyant material, the phellem layer of bark tissue that is harvested for commercial use primarily from Quercus suber (the Cork Oak). Trees having its bark harvested get significantly older than in its natural habitat. Linen fibres are used for clothing is stronger than cotton but less elastic. It is also less water consuming when grown. Flax mills for spinning flaxen yarn were invented by John Kendrew and Thomas Porthouse of Darlington, England, in 1787. Rattan is a renewable material made from climbing palms belonging to subfamily Calamoideae cultivated in Africa and Asia. It can be grown on host trees in secondary forests, fruit orchards, tree plantations or rubber estates where it is easy harvested. Both the skin and the core can be used for home furnishing. Seagrass is collected from the surface after released from the bottom of the riverbed. Vietnam has a long tradition of turning the material into woven items. Solid wood is durable, renewable and recyclable. IKEA is one of the founding members of Forest Stewardship Council (FSC). By 2020 IKEA will only use source wood from more sustainable sources (FSC certified and recycled wood).